Civita di Bagnoregio is close to all the major Tuscan and Umbrian cities of art. It is the ideal spot to enjoy a relaxing visit in harmony with a landscape that varies from ravines to rolling hills wooded with chestnut trees, and dotted with vineyards and olive groves. The immediate vicinity offers opportunities to visit captivating towns such as Orvieto, Bamarzo, Viterbo, Caprarola, Bagnaia and the plateaus of Alfina. For lake lovers, Lago Bolsena is one of Italy’s most beautiful in which to swim and enjoy a pleasant day’s boating. The spas are also a wonderful form of relaxation, the easiest to reach from Civita di Bagnoregio being the Terme dei Papi in Viterbo, or Saturnia, Bagno Vignoni and San Casciano. And let’s not forget that the beautiful Tyrrhenian Sea is less than two hours drive away. For those who like to go horseback riding or cycling there are numerous suitable routes that the Corte della Maestà may organize for its guests. Civita di Bagnoregio is the perfect starting point for those who wish to visit the art cities of Arezzo, Florence and Rome. Civita is located about 1 km from the town of Bagnoregio which you mustpass through driving along the main street (Corso Mazzini). Parking is located under a pedestrian bridge: leave your car and have a walk over the bridge (a few hundred meters). For our guests Court of Majesty has provided a baggage service to the residence. Once you’ve reached the village, pass the main arch, keep straight to the San Donato’s square, pass the church: the entrance is on your left handside. When you’ll see an old green gate, please ring the bell “Corte della Maestà”. In any case you may call us at your arrival in Bagnoregio. Coming from North, along the highway A1 direction Rome, exit atOrvieto, follow the signs for Castiglione Teverina and then the sign to Civita di Bagnoregio. Driving from Florence to Civita di Bagnoregio takes approximately 2 hours. Coming from South, along the highway A1 direction Florence, exit at Orvieto, follow the signs for Castiglione Teverina and then the sign to Civita di Bagnoregio. Driving from Rome to Civita di Bagnoregio takes approximately 1 hour 1/2. The train station where you have to stop to reach Civita di Bagnoregio is Orvieto (trains from all main Italian cities), than you can take a bus to Bagnoregio (1/2 hour travel). The Corte della Maestà can organize a car transfer from the train station to Civita (please let us know about it at least two days before your arrival). The nearest international airport is Rome Fiumicino (km 130). 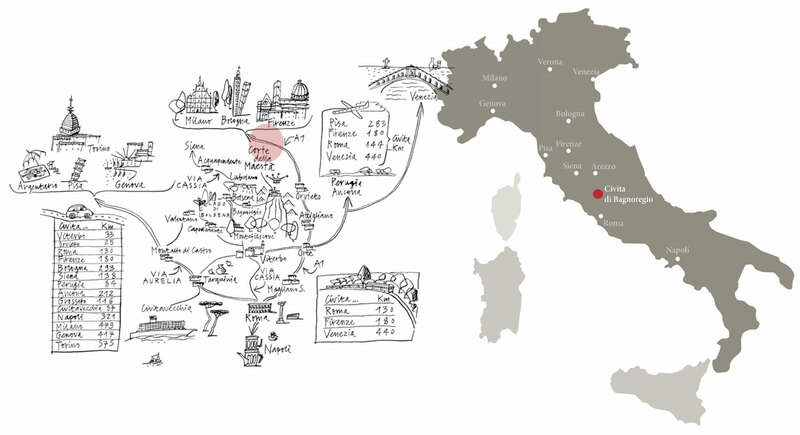 From the airport you can reach by train Termini Station (Rome’s main station) and from there by train, get to Orvieto. Corte della Maestà can also book a car transfer for you from/to the airport (please let us know about it at least two days before your arrival).